Released after the public had time to digest his first volume, this highly anticipated sequel again focuses on winning No-Limit Hold'em tournaments. Author and tournament specialist Dan Harrington (you can't pick a better team for hat choice) knows a thing or two about big tournaments. He won the 1995 WSOP Main Event and made back-to-back final tables at the Main Event in 2003 and 2004. Specifically, Volume 2 mainly discussed the later rounds of the tournaments where the increasing blinds become much more of a factor. Essentially, beginner's who don't know how to combat larger blinds will literally be eaten alive by them. Harrington, in his typical tight-aggressive style, gives excellent advice throughout this follow-up to his original bestseller. Interesting topics include the "M" theory in which you base your style of play on your chip stack relative to the blinds. Other essentials include how to play at shorthanded tables, which is what you'll face at the final table of multi-table tournaments and, more often, as players get knocked out in Sit 'n Gos. Also very important for the latter is a section devoted to heads-up play. This is aggressive and proper strategy that will leave you with fewer second-place finishes if you take it in. 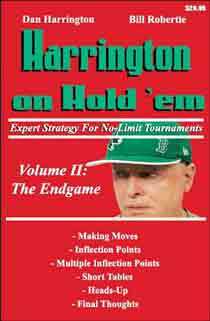 Overall, Harrington has written another tournament poker masterpiece that should be in every poker player's library. Harrington is one of the best in the tournament world and has an enormous amount of final-table experience. I definitely recommend this volume after you've completed and taken in the first in the series.